Magento remains the most robust eCommerce platform to-date. It has been under review over the last five years, culminating in the release of Magento 2. Many users wonder Why You Need to Move From Magento 1 To Magento 2 even though the first platform remains active and can still serve your purpose. Businesses looking for stability may feel that they may have a problem migrating to Magento 2. However, one should approach the migration process keeping in mind the transformation that this new platform can deliver to your operations. These benefits extend from the performance of your site to how it functions. The five years put in to the development of Magento 2 have gone into evaluating the strengths in order to reinforce them, and weaknesses to identify and put solutions in place. One of the strengths has been a robust platform that is easy to customize in order to give your store a personalized touch. The new platform now allows developers to develop a more personalized shopping site for you and your customers. Over the last 10 years, Magento has been the preferred ecommerce platform online. Magento considered suggestions it received from expert Magento development services and users over these years, to develop an enhanced robust platform. This means that Magento found and fixed the few issues that were bothering users of the previous version of the platform. Increased traffic at instances when you are running a campaign or you have a promotion, was a huge challenge for users of Magento 1. The first version of the platform was not built to load as fast. This means that few could handle surges in traffic. New developments in Magento 2 changes customers experience even when there is a surge in traffic. The new MySQL database system has allowed better processing of queries, re-indexing and caching. This process is important for Magento because it enables easier update of URLs, product data and inventory, among others things. With a more efficient indexing system, transactions are easier and faster to process. Magento 2 was also built paying more attention to performance. That is why re-indexing has been boosted with the aim of boosting the performance of your website. This has also opened up the possibilities of working with dynamic databases such as PostgreSQL, a preference for many who oppose the use of MySQL. The admin user interface has been one of the most problematic elements of Magento 1. The layout has been accused of causing confusion and being intimidating to first timers. That problem was solved in Magento 2. A compelling reason for Why You Need to Move From Magento 1 To Magento 2, is so that you can enjoy the responsive features of the new platform. The new version is easy to use and navigate. It means that you customer will get to pages or products they desire faster. The options you are given are not too many and confusing. This helps to improve customer experience, and in the process boost their liking for your store. The product interface has also been boosted on several fronts. It has allowed easy addition of images and videos to the page. This includes video URLs that can come from platforms like YouTube. In the wake of increased incidences of cyber-attacks, a lot of attention has gone into the security of the online platform. The process of development has also paid attention to these developments over the past 5 years. Developers have been working to improve security of Magento site. Personal information shared on Magento will never be compromised. This will enhance the confidence of shoppers who are looking for such an assurance. This is an attractive feature that will get them trooping to your website repeatedly. The process and requirements of checkout define the experience a customer has on any ecommerce website. This has been one of the concerns for Magento 1. On Magento 1, although the customer could checkout from a single page, there were too many steps to needed to follow to get to the checkout page. These steps were eliminated in Magento 2. The checkout experience is now smoother and easier to personalize, another attractive feature that will keep customers trooping back to your website in droves. A main concern for businesses was how to scale up their services. Even the best Magento development services would find trouble enabling scalability when working with the first version. With Magento 2, it is now easy to create pages and process more orders within an hour. You will therefore never worry about a growing number of clients and the need to process more orders. This is part of the overall performance improvements on Magento 2. Coding platform around the world has improved significantly. You need to integrate with a many more plugins than you would before. Magento 2 has opened up the power to integrate without exposing you to danger online. This means that you can now expand your payment systems, include customer loyalty programs and add more features to enhance your customer’s experience. The integrations are so seamless that visitors will enjoy visiting your page. 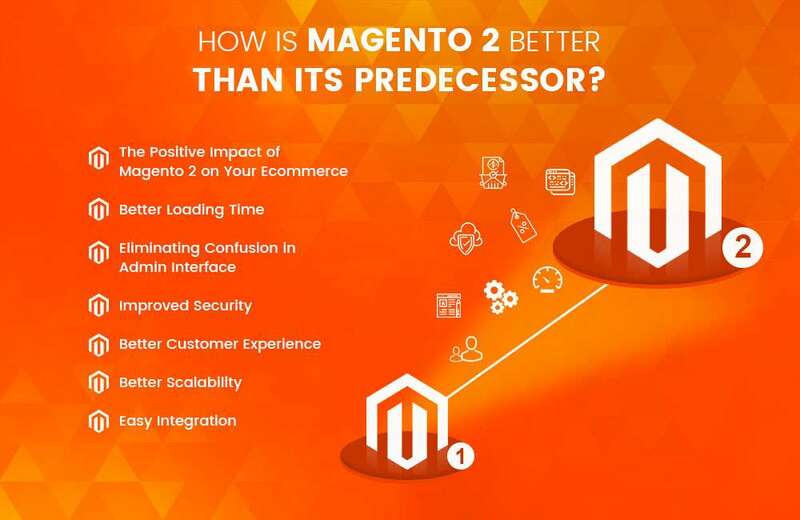 The development of Magento 2 has aimed at enhancing performance and giving visitors to websites built on the platform a better eCommerce experience. With greater mobile responsiveness, admin interface and features that improve security of Magento site, you have every reason to embrace the new platform. It will transform your ecommerce website into a site that everyone wants to return to repeatedly. Collaborate with a specialist Magento developer to ensure you enjoy the fullest scope of these benefits.